Oddly enough, many “ancient” products are being touted as breakthrough ingredients in today’s health and skincare niches. 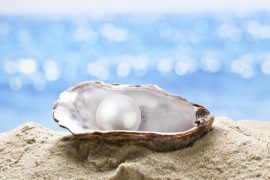 One such item is pearl powder, something that has been around for thousands of years, yet is suddenly one of the hottest ingredients for skin care treatments and products. Traditional Chinese culture has made use of this magical little powder for thousands of years, but we are finally starting to catch on. Pearl powder is the biproduct of grinding down actual pearls to a powdery consistency and considered a “marine treasure” in Chinese culture. Whether it is used on its own or mixed with other ingredients, many people tout its alleged significant benefits due to the fact it contains a significant amount of minerals, such as copper, selenium, magnesium, zinc, iron, and calcium. While you would think pearl powder would be quite expensive, that is far from the case. It can be purchased online in most cases for less than $20, a supply which should last you for quite some time if you are only incorporating it with other products in your skin care routine, such as raw honey. Facemask – no need to go to the spa for an expensive facemask treatment when you can whip one up right in your kitchen. Mix the ingredients, apply to face, and allow it to stay on face for about 20 minutes. Wash it off with lukewarm water and enjoy the glowing results! Finishing Powder – finishing powders can be very expensive, but a great substitute that will cost you much less is a pearlescent mineral powder. It will help control oils on your face and prevent your pores from getting clogged. For this, you will need to use a pearlescent magic mineral powder. Topicals – if you look around the web, we are starting to see more and more people report some very good results using both pearl powder and Manuka honey as a topical treatment. One of the more popular reasons for using these items as a topical is to help with acne problems. As always, before you make any big changes to your diet or skincare, we recommend consulting with your doctor to make sure what you are doing is completely safe, especially for anyone suffering from sensitive skin and/or allergies. Want to order some Manuka honey to try to the homemade facial mask? To get you order started, click here.